Did you know that since 2006, many countries like US, Canada, Germany, UK etc, have issued passports and ID include a radio frequency chip? And that electronic pickpockets can steal your ID and personal data.Many credit cards, driver's licenses, employee identification cards, and all current U.S. Passports contain a Radio-Frequency-IDentification (RFID) transmitter.These chips allow vendors to scan your cards easily at checkout and permit a quick read of your driver's license from a distance. Remember, if your credit cards or other identification cards are scanned without your knowledge, your money or your identity can easily be stolen.Protect yourself from payment fraud and identity theft with our RFID blocking product. Our genuine leather product feature the best RFID shielding in the industry. Every single pocket on every single pocket is entirely shielded individually, locking your personal information safely inside. LARMA was established in 1983, mainly engaged in garments, leather design, development, production and sales of products for garments, leather, shoes, bag etc. Under the careful guidance of Italian master and meticulous design of senior leather designers, the products blend leisure and classic which are fully explained the fashion of brand concept. "Winning by quality, brand management" is the determination by LARMA. The products from LARMA are comfortable, elegance and charming. People of LARMA are meticulous care about the package design, color of skin, type of skin and the selection of the match.Especially focus embodies metropolis male mature, elegant, romantic features to design. Through the acquisition of European fashionable element, combined with men of high grade design concept, their character distinct "LARMA" male pack to a special, positive, fashionable concept of life. [High Quality Material] Luxurious Cowhide Leather, Durable Poly-cotton Lining With Custom Electroplating Hardware Parts. 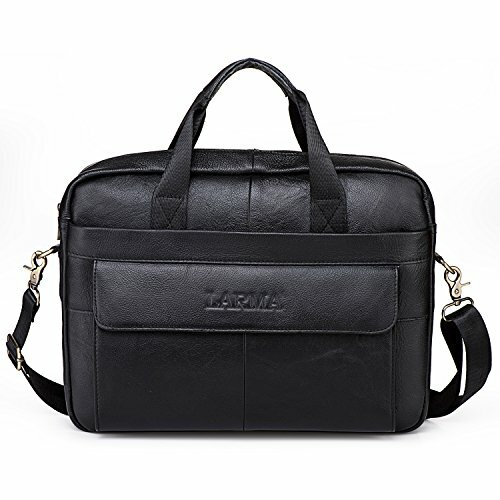 [Internal Structure] Contains 1 Big Inner Compartment, 1 Laptop Pocket. 1 Cell Phone Pocket, 1 Cigarette Case Pocket, 1 Zipper Patch Pocket.Easily Hold Your 14 in Laptop, iPad, iPhone, A4 File, And Other Business Things. [Fashion And Practical Design] Close And Careful Stitching, In Strict Accordance With The Process Of Craft. Stereo With Fashion Type, Secure And Stylish Single Gusset Construction Expands For Greater Carrying Capacity. Bring a lot of fantasy to your daily life;Super cool and fashionable gift for everyone. [Amazing gift for everyone] 100% Top genuine leather.Original POLO Clothing and Accessories designed from Italy. If you have any questions about this product by LARMA, contact us by completing and submitting the form below. If you are looking for a specif part number, please include it with your message.